Mazza’s Rewards is the exclusive Mazza’s ® loyalty program that allows you to earn Mazza’s Rewards for every qualified purchase you make at Mazza’s in Mount Vernon! What are the benefits of Mazza’s Rewards? Receive a $5 reward just for signing up. Earn cash back in Mazza’s Rewards for every purchase at Mazza’s Mount Vernon. Receive a Free DESSERT on your birthday. Receive a Free DESSERT on your anniversary. Your rewards are automatically saved to your Mazza’s Rewards account. To redeem them, just present your Mazza’s Rewards card or registered phone number at the time of purchase. Your Mazza’s Rewards card can also be used as a prepaid/stored value card. As a registered and opted-in Mazza’s Rewards member, you may also receive special promotions, coupons and invitations to exclusive events at Mazza’s. Do my Mazza’s Rewards ever expire? The rewards you earn from sales and take-out orders do not automatically expire. However, additional promotional rewards we add to your account (e.g., birthday, anniversary, holidays) do expire if unredeemed by the expiration date. Please carefully review your email or text message notifications and redeem your promotional rewards by the stated expiration date. I have accumulated Mazza’s Rewards Points but why can't I redeem them? The only way to redeem rewards that have you have earned is by activating and registering your Mazza’s Rewards account. Until you register your Mazza’s Rewards account, you will not be able to redeem your rewards. You will, however, continue to accumulate Points for qualified purchases at Mazza’s. If I have added dollar value to my Mazza’s Rewards card, can I still use it even though my card is not registered? Yes. Whether or not you activate and register your Mazza’s Rewards card, you can load or reload it as a prepaid/stored value card. And, regardless of the dollar value on your Mazza’s Rewards card, you’ll earn Mazza’s Rewards every time you make a qualified purchase at a participating Mazza’s location at the time of purchase. What is considered a qualified purchase for earning Mazza's Rewards? Qualified purchases are based on actual dollars tendered for menu item purchases made at Mazza’s. The purchase of a Mazza’s gift card is not a qualified purchase. Qualified purchases are determined by Mazza’s in its sole discretion and may be changed without notice. How do I register for Mazza’s Rewards? You can join Mazza’s Rewards by registering online (www.mazzas.com) or with just your phone number. Now, you can earn Mazza’s Rewards and redeem any earned Mazza’s Rewards rewards by providing your registered phone number at a participating Mazza’s store. FIRST, obtain a Mazza’s Rewards card at Mazza’s location. NEXT, have the card activated by a Mazza’s Team Member before you leave the location. This is important because you will not be able to register the card if it has not been activated. THEN, register your Mazza’s Rewards card online at www.mazzas.com. After you have registered your card, start earning Points for all of your qualified purchases. If you want a physical card, you can bring your online account number to your local participating Mazza’s store and they can “Exchange” that account number for a new card. This will transfer any previous Points and rewards to your physical card. . I'm having trouble registering my Mazza’s Rewards card. I'm getting an error message telling me that my Mazza’s Rewards card is not activated. Why? If you pick up a Mazza’s Rewards card from our location and the card is not swiped prior to you receiving it, it will not be activated and therefore, you won’t be able to register it. 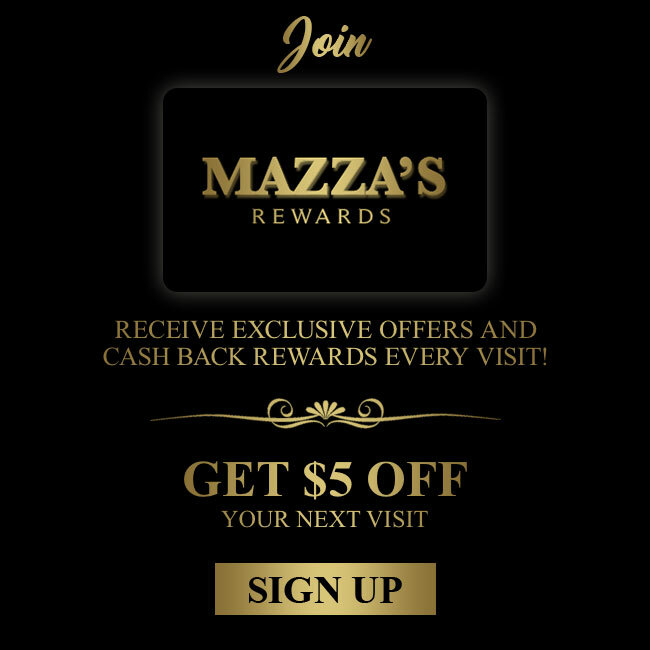 If this happens, email us all of the numbers listed on the back of the Mazza’s Rewards card (contact@mazzas.com) so that we can activate your card, which will allow you to complete the registration process.You can also visit Mazza’s location and request to activate your card onsite. Remember to bring your receipt so that you earn Points for your previous purchase(s). Can I get Mazza's Rewards for purchasing a Mazza’s gift card? No. You cannot receive Mazza’s Rewards for purchasing a Mazza’s gift card. Can I use rewards to purchase a Mazza’s gift card? No. You cannot use rewards to purchase Mazza’s gift cards. Can I use any earned Mazza’s Rewards rewards in conjunction with other coupon offers? No. Rewards cannot be combined with any other offers. For example, if you have a buy one get one free (BOGO) coupon and a $5 reward and you purchase two Mazza’s Salads, each with a cost of $5, you can either choose to use your BOGO coupon and pay $5 (plus applicable taxes) or use your $5 reward and pay $5 (plus applicable taxes) for the cost of the second Salad. Sorry, but you could not use your BOGO coupon and your $5 reward together and get both Salads for free. If your Mazza’s Rewards card is ever lost or stolen, visit Mazza’s location and request a new Mazza’s Rewards card. I forgot my Mazza’s Rewards card during my last visit. Can I still get Points for my purchase? Yes. Please use your phone number associated with the account. I forgot my username or password for my Mazza’s Rewards account. What do I do? You can request a new password online here. Please note that your use of a Mazza’s Rewards card and/or Mazza’s gift card constitutes your acceptance of the complete terms and conditions of our loyalty and gift card programs. Mazza’s may, at any time, and at its sole discretion, modify these terms and conditions, with or without notice. Such modifications will be effective immediately upon posting. You agree to review these terms and conditions of use periodically, and your continued use of your Mazza’s Rewards card and/or Mazza’s gift card following such modifications will indicate your acceptance of any modified terms and conditions of use. If you do not agree to any modification of the terms and conditions of use, you must immediately stop using your Mazza’s Rewards and/or Mazza’s gift card.